Greetings from the Olympics!! . . . Well, not really, although in some ways my head is still at “the games” (or maybe I just left it in Heathrow’s Terminal Three, while making a mad dash for my flight to the U.S. late Tuesday). In other words, I may technically be back at my desk in New York City, but I don’t feel entirely “here” yet. Such is the dislocating effect of international travel, though the extraordinary energy surrounding an event such as the Olympics surely also has something to do with the gummy state of my brain this morning. There was something truly strange about standing in my bedroom late last night watching highlights from the American women’s win in gymnastics earlier in the evening, knowing that just one day prior I’d been sitting (and standing, and cheering) in the very same venue, watching the British men’s team win their first medal in gymnastics in more than 100 years. Seeing the athletes and the venues up-close brings everything down to earth, but it’s a shift that only makes what you’re witnessing that much more incredible. And once experienced, it’s a perspective that carries over to the televised version (at least it did for me). In any case, while my intent had not been to offer a complete rundown of the various events I took in during my four days at the Olympics, I had hoped to share with you what I thought would be an interesting sideshow: the food being served at the corresponding venues. I guess I’d hoped that for London’s Olympic games some local talent along the lines of a Gordon Ramsay, or a Jamie Oliver, or a Nigella Lawson would be called into service. I mean with all the talk of Britain using the Olympics to show the world just what they were capable of, it didn’t seem unreasonable to imagine that visitors would be offered at least a few food options as exciting as the events they had come to see. Regrettably, it was not to be. While the stadium where the opening ceremonies were held did offer a few Indian food options, the overwhelming majority of concessions there and elsewhere offered the standard array of pizza, chicken sandwiches, and . . . you guessed it, McDonald’s—an official sponsor of the 2012 Olympic Games. 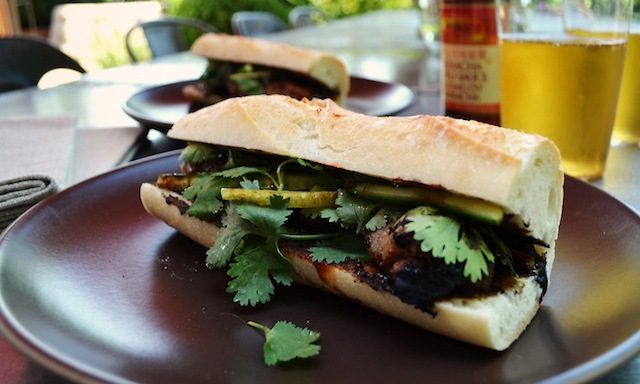 So rather than reporting on my own four-day marathon of Olympic scale eating (because there’s only so many Big Macs even I can eat) I’m instead bringing you this recipe for a grilled-pork banh mi sandwich. It’s the sort of thing I’d have been only too happy to find at any of the London venues I visited, and a dish that will surely make an appearance should The Games ever end up in Vietnam. The recipe comes from the May issue of Food & Wine—and more specifically from chef Luke Nguyen (of Luke Nguyen’s Vietnam, which airs weekly on the Cooking Channel). As Nguyen explains, it’s a sandwich he literally sniffed out while exploring the streets of Saigon a number of years ago. 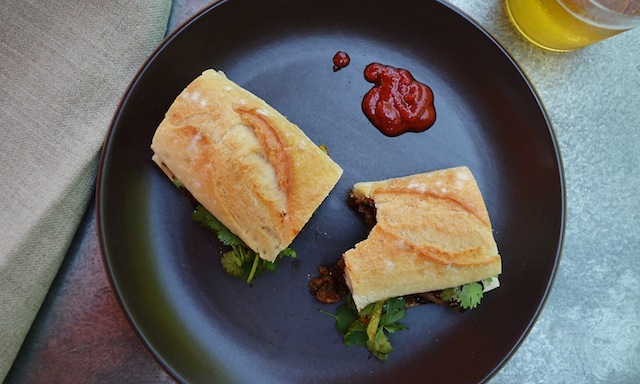 (In Vietnamese, the words “banh mi” refer to any kind of bread—though often it’s the baguette, which was introduced there by the French way back when). Now Asian street food has obviously gotten a fair amount of attention over the last several years. And deservedly so; at least from what I’ve sampled it’s not hard to see why these simple, flavorful dishes are not just popular in Seoul, or Bangkok, or wherever the item in question might have originated, but in the various American cities where they’ve been introduced as well. Nonetheless, I’ve never been the least bit tempted to try making any of them at home. That is, not until I came across this particular recipe. I suppose the principal reason for this turnaround lies in the sandwich’s signature ingredient: grilled pork. Even in my current (mostly) non-meat eating mindset I could recognize that there are few sandwich fillings more satisfying than thinly sliced pork tenderloin that’s been cooked over an open flame. Add to this the fact that, prior to cooking, the sliced pork was to be added to a sweet and sour marinade of fish sauce (a savory liquid made from fermented fish with sea salt if you must know), which is then mixed with small amounts of honey, sugar, pepper, scallions and garlic and left to soak for a few hours, and I knew that the meat would be something special indeed. It didn’t hurt either that alongside the pork would be nestled a few sprigs of cilantro and a cluster of matchstick-sized, seedless cucumber slices, or that the whole combo would be tucked within the downy embrace of a sandwich roll that had been slathered with a combination of Hoisin sauce (for a bit of spicy sweetness) and fiery Sriracha chile sauce (Thailand’s version of hot sauce). So yeah, count me in for exactly all of those reasons. But there were a few issues to be resolved first. Although the cooking instructions couldn’t have been simpler and—aside from the time needed to marinate the meat—required little more than a half hour or so in the kitchen, it did call for cooking the pork on a barbecue, a piece of equipment to which I have only occasional access. What’s more, the recipe listed a variety of Asian ingredients I wasn’t certain I could lay my hands on without committing to a lengthy search, something that tends to kill my enthusiasm for most cooking projects. As it turns out this last concern was a non-issue, since all of the ingredients (the Hoisin sauce, the fish sauce, the Sriracha) were easily sourced at my local Whole Foods. What’s more, the Sriracha—the one ingredient I was most concerned about locating—even turned up at my local corner deli, wedged between the Dijon mustard and the Hellman’s mayo. In other words, none of these ingredients should be too hard for you to locate. And as for that cooking issue, instead of waiting until I found myself with easy access to a charcoal or gas grill, I decided to put my grill pan to use instead. True, the meat wouldn’t benefit from the pleasant char that only direct contact with an open flame can deliver, but I figured the various other flavors at play would be sufficient to allow for this minor deviation. 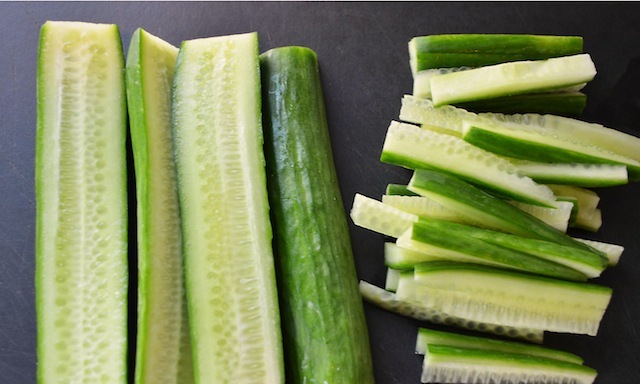 And so I set to work, whirring the marinade ingredients in the blender, then dropping the thinly sliced meat into the mixture, and placing the whole combo (covered) in the fridge for a few hours—plenty of time during which to slice the cucumbers, pull apart the cilantro sprigs, even read the paper. By the time I’d done all of that the two hours were up, at which point I threaded the pork onto the bamboo skewers as directed (placing the tip through the top and bottom of each slice; roughly four slices for each of the twelve skewers), though first making sure to soak the skewers in water for an hour before adding the meat. This last step is actually one the recipe doesn’t mention, but that nonetheless struck me as a good idea regardless of your cooking method, as you don’t want the bamboo to burn away before you have a chance to remove the meat from the heat source. And if you decide to prepare the pork on the stove as I did, plan on letting it stay in the pan a little longer than the four minutes listed in the recipe (for anywhere between eight and ten minutes) as even on high heat a grill pan simply can’t generate as much heat as a gas grill. Other than the cloud of smoke produced by my revised cooking method (as previously noted in these pages, my NYC exhaust system just doesn’t work all that well) I couldn’t have been happier with the results. 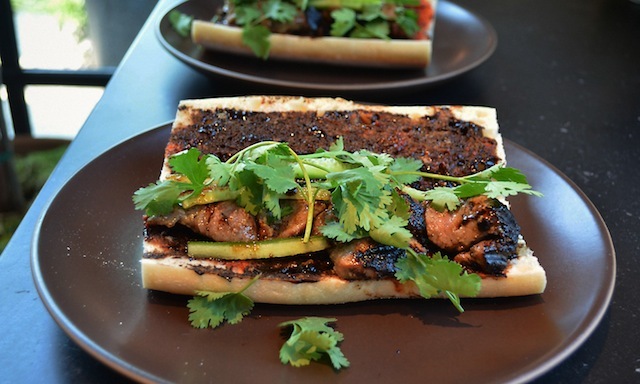 The pork was crisp and tender, with just the right amount of sweet/spicy caramelization on its exterior (thanks to the honey and sugar), and the various other ingredients—the heat of the Sriracha, the cooling effect of the sliced cucumber, the pleasant bitterness of the cilantro—proved the perfect foil for the yin and yang quality of the meat. It was everything a French roll could possibly want, not to mention my own gold medal appetite. —A grill or grill pan. 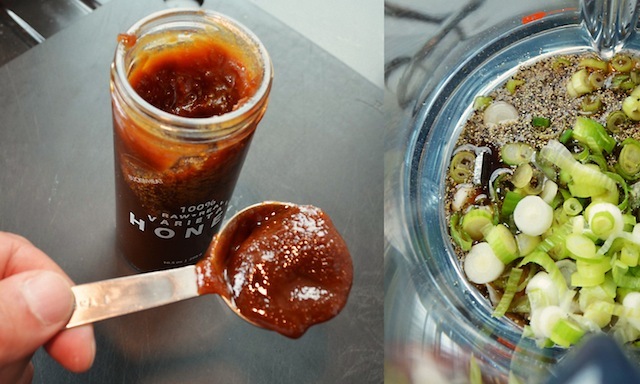 —In a blender, puree the fish sauce with the honey, sugar, pepper, scallions, and garlic. 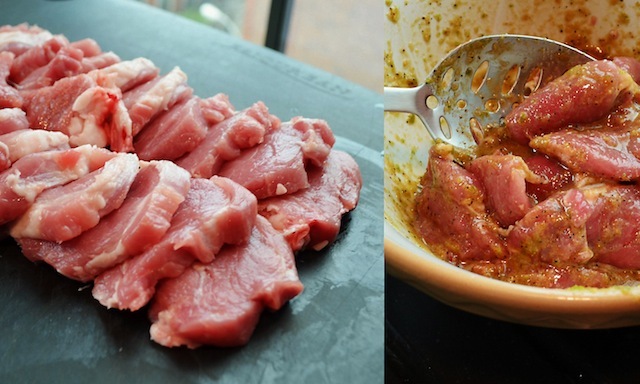 Transfer the marinade to a bowl, add the pork, and toss. 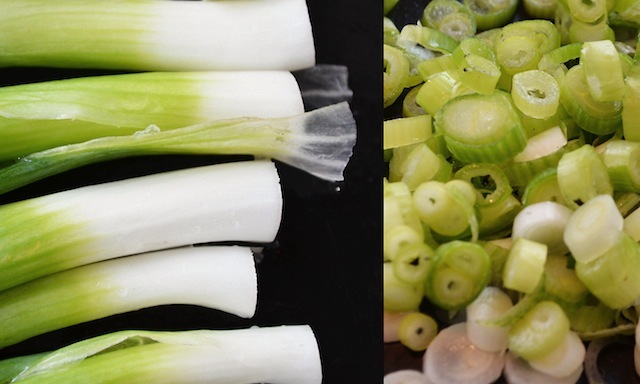 Refrigerate for 2 to 4 hours. 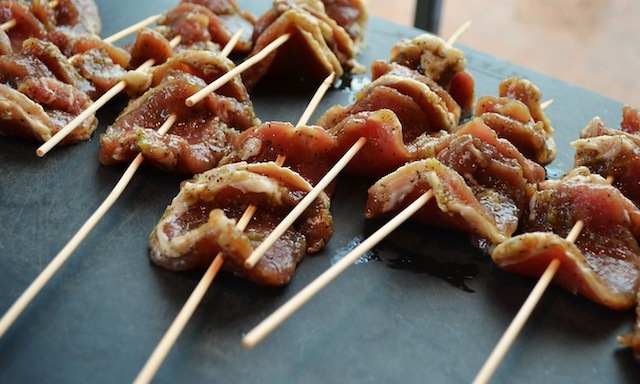 Thread the pork through the top and bottom of each slice onto 12 bamboo skewers. 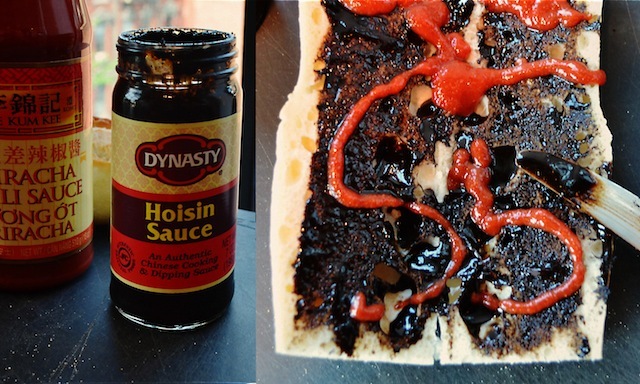 —Spread the rolls with hoisin and Sriracha. 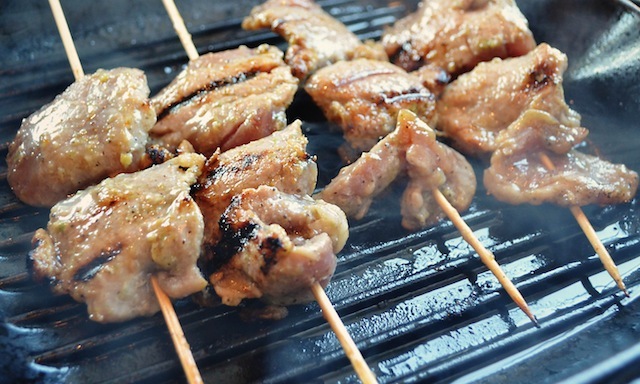 Light a grill and oil the grates (if using a grill pan, use the oil to moisten the pan). Brush the pork with oil and grill over high heat, turning until just cooked, 4 minutes (8 to 10 minutes if using a grill pan). Place two skewers in each roll, close, and pull out the skewers. 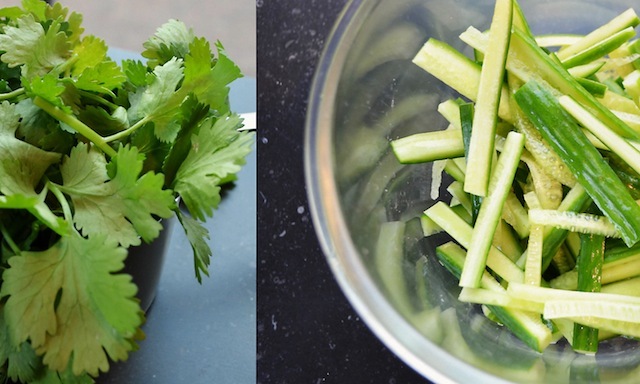 Top with the cucumber and cilantro, and serve. I JUST HAD BREAKFAST, WHAT THE HELL I'LL HAVE ONE OF THOSE TOO.